London Buses manages bus services in London and they contract out routes to private operators. East Croydon is well served by bus routes - including some running through the night - provided by various operating companies. 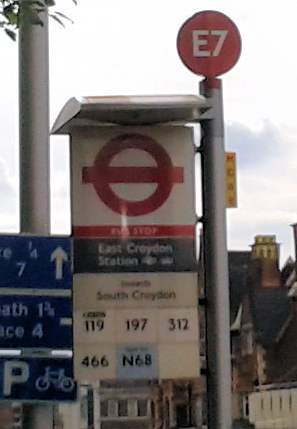 The majority of these routes run along Wellesley Road and/or past East Croydon station. Live updates of expected arrivals are displayed at many bus stops. Details are also available online. To ensure greater accessibility for all, TfL operates the door-to-door Dial-a-Ride service for transport users with impaired mobility. National coach services operate from Victoria Coach Station, close to London Victoria rail station. TfL regulate London's taxis (black cabs) and private hire (mini cabs) trade. There is a dedicated rank for licensed taxis at the side of East Croydon station. There are also a number of licensed private hire operators are based in or close to East Croydon and details of how to book, including safety advice, can be found at the Public Carriage Office (PCO). traintaxi provides details of taxi services serving National Rail, London Underground, Tramlink and Docklands Light Railway (DLR) stations. The Taxicard scheme provides subsidised door-to-door transport for people with mobility problems. E-mail web.team.1801@BitterCreek.co.uk with questions or comments about this web site. Copyright © 2006-2018 Bitter Creek Limited. All rights reserved. Terms and conditions.